I just want to write you a quick update on Brett Kavanaugh: Trump’s anti-environment, anti-worker, anti-woman nominee to the Supreme Court. First, and this is important, it’s not too late to stop this nomination. In fact, we may be getting closer to beating Trump and Kavanaugh. BUT we can only do that if we keep up the pressure – so whether you’ve called before or not, call your Senators right now, today, and tell them they must vote No. Call (202) 224-3121 and ask to speak to your Senators or toll free 866-426-2631 and our friends at SEIU will connect you. Now, a quick update: It’s been a rollercoaster few days as the FBI was rushed through an investigative process where they were instructed to only talk to 9 people, none of whom were Dr Blasey Ford or Judge Kavanaugh, one of whom refused to answer questions. At the end of that deeply flawed, completely inadequate investigation, the results (some 50 pages of notes and documents) were delivered to a sealed room in the US Senate, where all 100 Senators were given about a day to read them, one at a time. Several Senators, including South Carolina’s Lindsey Graham admitted they didn’t even read the documents, they just listened to a briefing by some staff, and decided not to change their vote. BUT this morning, something really important happened. Senate Majority Leader Mitch McConnell called a cloture vote – basically ending the confirmation process, and calling the question of whether – based on what they know right now – Senators are ready to vote for or against Kavanaugh’s nomination. In a big surprise, Senator Lisa Murkowski of Alaska voted NO on cloture. Several other swing votes – including Joe Manchin of West Virginia, Jeff Flake of Arizona and Susan Collins of Maine – all voted yes on the cloture motion and it passed 51-49. That sets off a final 30 hours of debate with a vote expected tomorrow afternoon. This is a big deal because it’s very rare for a Senator to vote no on cloture, and then yes on a nomination. Murkowski is probably a no vote. And Collins, Flake and Manchin’s votes in favor of cloture don’t mean that they’ll vote yes on the nomination, just that they’re prepared to cast their vote. If Murkowski is a no, and 2 of those 3 remaining swing votes can be convinced, Kavanaugh’s nomination will fail. And just as important, Murkowski’s no vote on the process is a sign that some republicans still aren’t satisfied by the FBI investigation and hearings to date. If Murkowski can vote no, every Republican with a conscience can be persuaded. Now, to be clear, the almost-all-male, almost-all-white Republican caucus is not likely to change it’s mind. But we only need a handful of votes, and Mukowski’s no this morning indicates we may be moving in the right direction. And, finally, the most important point – that’s all because of you, and me, and all the protests and calls and public outcry. White, male, Republicans (including Trump) have been taking to TV and twitter all morning to complain about how ‘rude’ survivors of sexual assault are being; Or to complain about how well organized our movement is to stop Kavanaugh. While a lot of their talking points are utter nonsense (like Trump claiming George Soros is personally responsible for all the outcry) – it indicates that our pressure is getting to them. We can win this thing in the next 30 hours. A huge coalition of us are hosting a people’s filibuster on the Senate’s front lawn, and we’re prepared to talk all night to delay or stop the vote on Kavanaugh’s nomination. And a big wave of national rallies are planned for tomorrow (Saturday). We need you to participate – tune into the livestream and wave, send a comment, or share with friends. 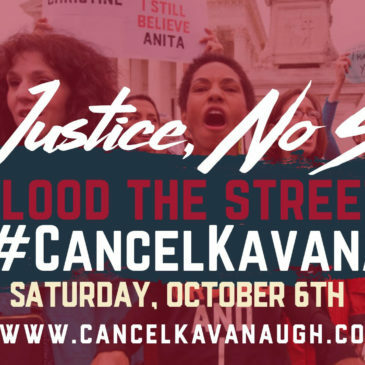 Sign up to attend a rally near you tomorrow and bring a sign. But most importantly, make your voice heard right now and for the next 30 hours – Call (202) 224-3121 or toll free with SEIU 866-426-2631 and tell your Senators to vote NO on Judge Kavanaugh. Need help with what to say? Click here for some talking points and more background. ← Believe Survivors. Stop Kavanaugh.